What is white whole wheat? I have only recently heard about white whole wheat flour, which is reported to retain the nutrients as a whole grain flour but be lighter in look and flavor. Standard whole wheat flour is made using red wheat which is darker in color and makes a heavy whole grain flour or requires lots of processing to make into white flour By contrast, white whole wheat flour is made with albino wheat which is an entirely different variety. This type of wheat grain has a lighter hue and requires much less processing to produce a flour that is more similar to bleached white flour. 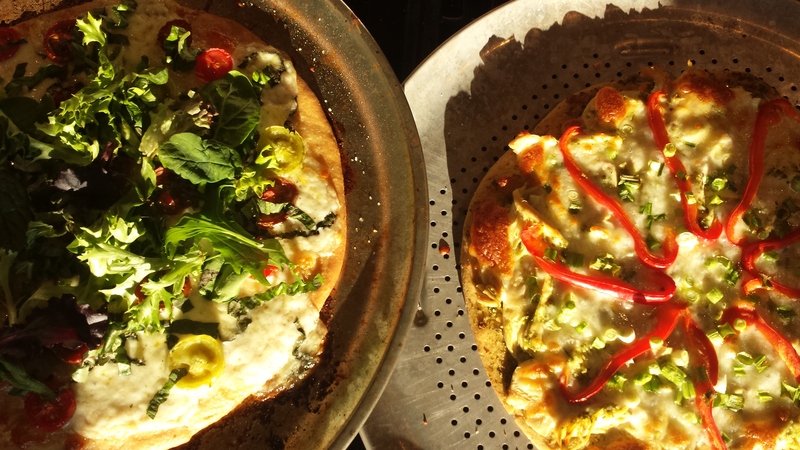 This recipe makes one large or two small pizzas. 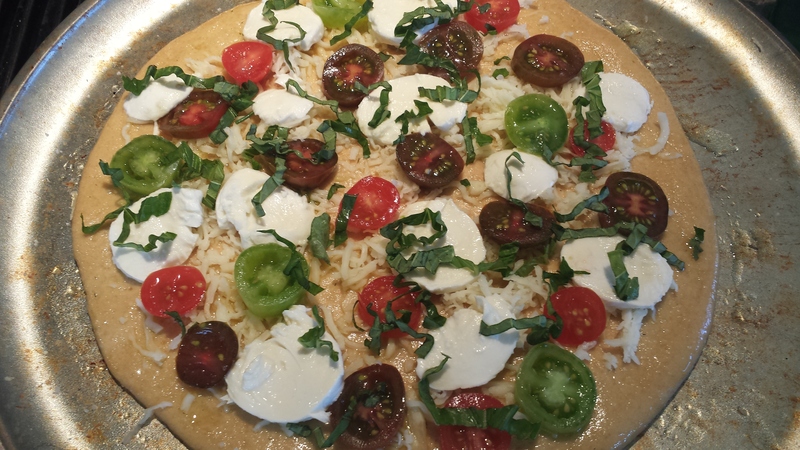 I cut my dough in half and topped one with olive oil, garlic fresh mozzarella, sliced tomatoes and fresh basil. 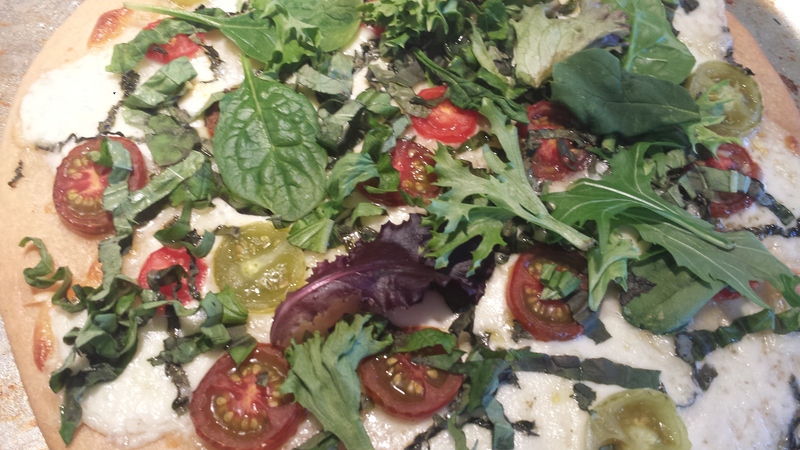 I topped the finished pizza with more basil and fresh greens. 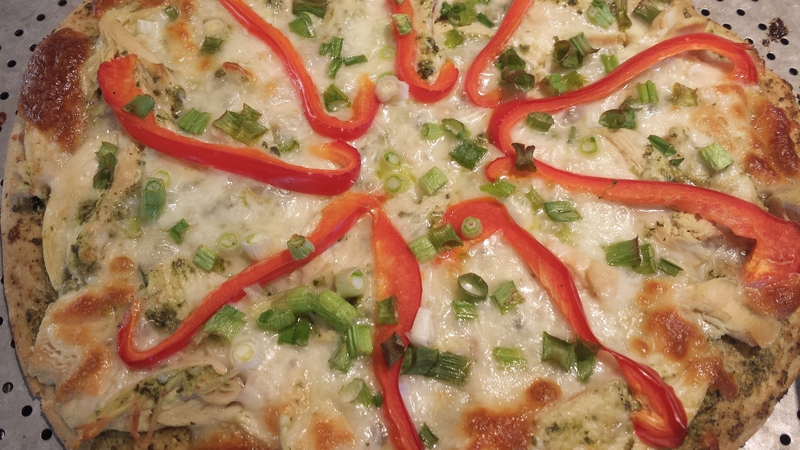 The second pizza I topped with pesto, sliced cooked chicken, shredded mozzarella, red peppers and scallions. I followed the recipe and found it nice to make the dough the night before and just roll it out and les it rise before game time. Makes a great halftime appetizer. Just glad my team won! What’s with the orange juice in this recipe? No, it doesn’t make your pizza taste like oranges; but it does mitigate the somewhat tannic flavor whole wheat can sometimes have. Substitute water if desired. Can you use traditional red wheat flour in this recipe? Absolutely; your crust will be darker, and more assertively flavored due to red wheat’s stronger taste. 1) Combine all of the ingredients, and allow to rest for 30 minutes; this gives the whole wheat flour a chance to absorb the liquid. 2) Mix and knead — by hand, mixer, or bread machine — to make a smooth, soft dough. 3) Transfer the dough to a bowl, cover it, and let it rest at room temperature for 30 minutes. Refrigerate overnight, or for about 18 hours; a bit longer is fine. Handy schedule: Make pizza dough at 8 p.m., and refrigerate until 4 p.m. the next day. Shape, let rise for 2 hours, and bake at 6 p.m.
4) Remove the dough from the refrigerator. Pat it into a lightly greased half-sheet pan (18″ x 13″) that’s been drizzled with olive oil. This will make a thick-crust, Sicilian-style pizza, one that’s thick enough to undergo the long bake at a high temperature necessary to optimize its antioxidants. 5) Brush the dough with sauce, if desired; and top with your favorite cooked toppings: cooked vegetables, and/or cooked or smoked meats. Don’t add the cheese yet. 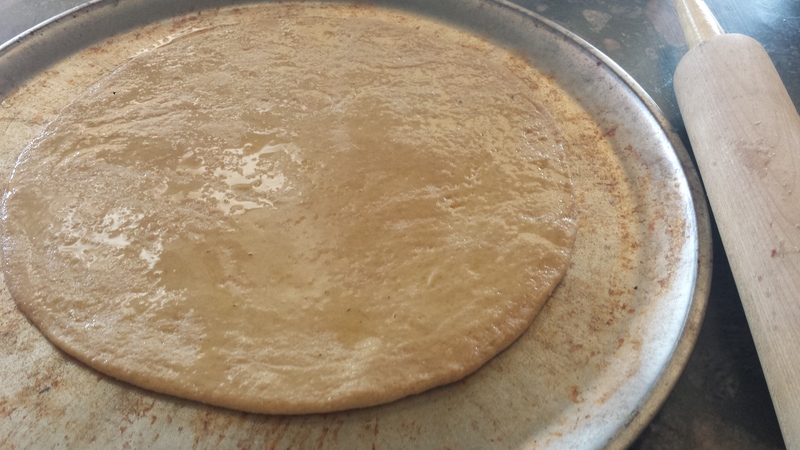 Cover the pizza, and let it rise for about 2 hours, or until it’s very puffy. Towards the end of the rising time, preheat the oven to 450°F. 6) Bake the pizza on the bottom shelf of the oven for 8 minutes, then remove it from the oven and top with cheese, if desired. 7) Replace the pizza on a shelf in the upper third of the oven. Bake for an additional 6 to 8 minutes, until the cheese is melted and the crust browned. 8) Remove the pizza from the oven, let rest for about 5 minutes (for the cheese to settle), and serve right away. If not serving right away, transfer the pizza to racks to cool, so the bottoms stay crisp. 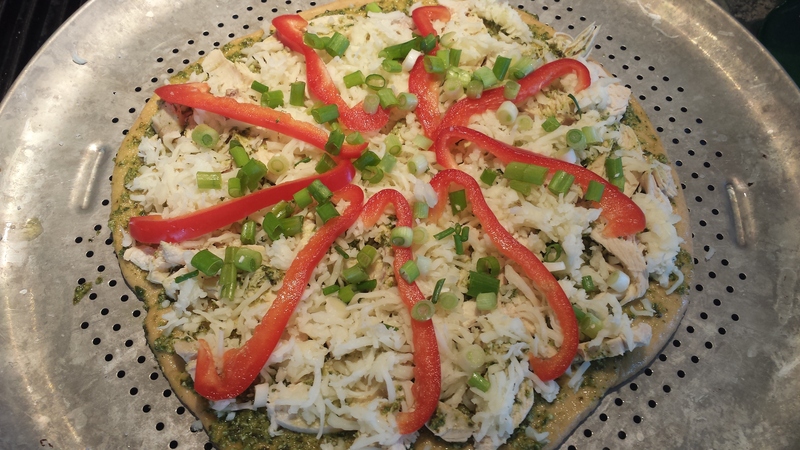 This entry was posted in All Recipes, Appetizers, Pizza and tagged Chicken Pesto Pizza, King Arthur, Margherita Pizza, Pizza, white whole wheat flour, white whole wheat pizza crust, Whole-wheat flour. Bookmark the permalink.